Description: Tall, or Shiny Oregon Grape is the floral emblem of the state of Oregon. It is an erect, evergreen shrub, 3-10 feet high. The new growth is often copper-colored, the flowers are bright yellow, and the berries are dark blue and edible. Makes a great partial screen or low hedge, good for hedgerows. Sun-shade, low water, well-drained soil. Meriwether Lewis compared two species of Oregon grape in his journal entry of February 12, 1806, from Fort Clatsop. "There are two species of ever green shrubs which I first met with at the grand rapids of the Columbia and which I have since found in this neighbourhood also . . . the stem of the 1st [Shiny, or Tall, Oregon Grape] is from a foot to 18 inches high . . . and erect.it's leaves are cauline, compound and spreading. the leafets are jointed and oppositely pinnate, 3 pare & terminating in one . . . each point of the their crenate margins armed with a subulate thorn or spine . . .they are slso veined, glossy, carinate and wrinkled . . .resembles the plant common to many parts of the U'States called the mountain holley. . . the stem of the 2nd [Cascade, or Dull, Oregon Grape]is procumbent. . . jointed and unbranched. it's leaves are cauline, compound. . .the leafets 2 1/2 inches long and 1 inch wide.greatest width 1/2 inch from their base . . .they are jointed and oppositely pinnate, consisting of 6 pare and terminating in one, sessile serrate, or like the teeth of a whipsaw, each point terminating in a small subulate spine,being from 25 to 27 in number; veined, smooth, plane and of a deep green." 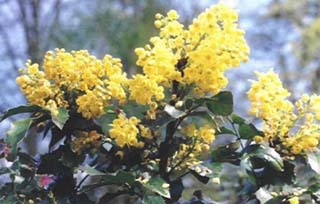 Lewis again referred to Tall Oregon Grape on April 9, near the present-day Bonneville Dam on the Columbia River. "the dogtoothed violet is in blume as is also both the species of the mountain holley." .